I'm not a runner. I always thought running felt free and fun, but my knees have never agreed with me. My first year at SAU I tried intermittent (jogging/walking) training for 30 minutes on our nice cushioned track. I regretted it for the next 2 weeks as my knees creaked and crackled all the way up the girl's dorm stairway. From that point on I decided...running and I just can't be friends. So I would only watch with longing as my friends trained for marathons, mid-night races, or even 50 mile trail runs (incomprehensible!). Now that you have the background, you can fully appreciate my feelings when Emily ask me if I wanted to do the Pink Army 5K fundraiser her hospital was sponsoring. I'm not a runner, I'm a walker, and I informed her of this with much conviction. She assured me walkers were welcome so I agreed to go along and give support. As the race began I decided I would jog along with Emily til I couldn't keep up. We picked a nice slow, easy pace. After about 10 minutes I excitedly informed Emily that I had set a lifetime record already! From then on out I just kept thinking "I could go a little longer...". I had set my goal as the halfway mark, but when we approached it Emily turned on her highly persuasive motivating skills. "Come on Heather, you've already come half-way! You can do this! Just think how great it will feel to say you ran the WHOLE WAY!" I was easily convinced. Just then, we passed the water station and a bunch of enthusiastic ladies (one was wearing a flamingo hat - it was spectacular!) yelled encouragement. As we headed back toward the finish line one of them called out "We're all survivors!" It was then Emily and I realized the entire water station was manned by cancer survivors. For the next half mile we discussed what they had been through. I realized the heat and sore muscles I was feeling was nothing compared to what they had suffered through. I could still breath so I could still run. The last 4th of the race was the hardest, as Emily predicted, but the sprint to the finish felt epic. 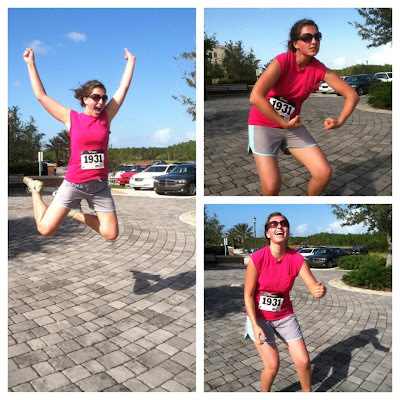 I couldn't believe I had jogged for more than 10 minutes, much less the entire 5K! Oh the feeling of accomplishment! I was exhausted but still managed to have energy for the above victory shots. It has yet to be seen if this "walker" is going to be using a walker in the next couple days, but I'm still thrilled to have conquered something I've avoided for years! It really made a few Bible verse come alive to me. "Therefore, since we are surrounded by such a huge crowd of witnesses to the life of faith, let us strip off every weight that slows us down, especially the sin that so easily trips us up. And let us run with endurance the race God has set before us." “All athletes are disciplined in their training. They do it to win a prize that will fade away, but we do it for an eternal prize. So I run with purpose in every step. I am not just shadowboxing. I discipline my body like an athlete, training it to do what it should." The one I'm personally claiming..."Strengthen your feeble arms and weak knees." Hebrews 12:12. So thankful feeble, weak knees don't keep me from running the race of faith! That's SO awesome! Good for you Heather :-) Love the pictures.